Ever wanted to be a code breaker listening in on secret transmissions from the enemy side? 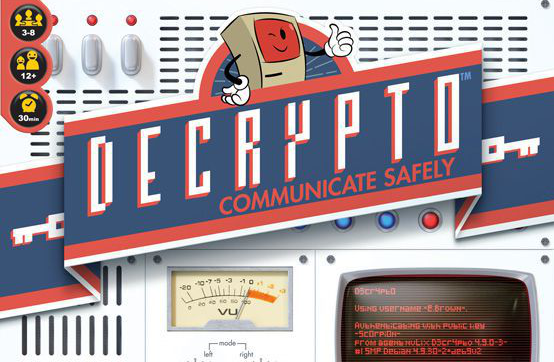 Now you can in the latest game in at Game Point, Decrypto! In Decrypto, the new game from publisher iello games, two teams square off and try to intercept each other’s secret code. Steal their signals twice and you win but fail to get your own team the secret message and you lose the game. Decrypto can’t currently be purchased online – so you’ll want to come in to try and buy this great new title at Game Point. In more detail, each team has their own screen, and in this screen they tuck four cards in pockets numbered 1-4, letting everyone on the same team see the words on these cards while hiding them from the opposing team. In the first round, each team does the following: One team member takes a code card that shows three of the digits 1-4 in some order, e.g. 4-2-1. They then give a coded message that their teammates must use to guess this code. For example, if the team’s four words are “pig”, “candy”, “tent”, and “son”, then you might say “child-mouth-tail” and hope that your teammates can correctly map those words to 4-2-1. If they guess correctly, great; if not, you receive a black mark of failure.